I am by no means anywhere near the talent that PunkRockPaint is when it comes to original artwork. And, to that end, the player pictured above is actually HIS design. 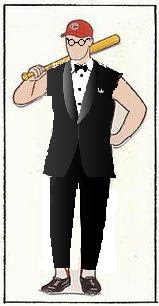 All I did was put a tux on the guy. For those that suffered through the Tribecards Trundles fantasy season last year, let me tell you that this year, the boys will be looking sharper. How they play is a whole different story. That will just have to be seen. Oh yeah, I added "Wild Thing" glasses for good measure. The Tribecards Tyrants are here for a comeback!